Telecommunications equipment is changing rapidly to adapt to global environments without reliable power or local support. 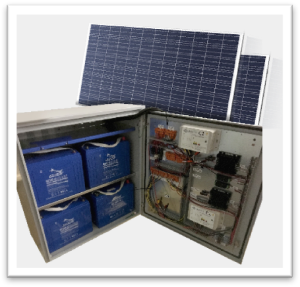 Our Telecom Smart Off-Grid Power Pack solution delivers a highly reliable source of power using solar and hybrid solar, with built-in communications, and the ability to remotely monitor, control, and proactively manage these devices over the Internet using our Smart Off-Grid cloud software. Clear Blue’s expert service team provides the ongoing management service to deliver high reliability, long-life and peace of mind. Supports multiple batteries and types. Read the comparison of lithium ion to lead acid batteries.